FINEXTCO is business of office for lease such as: Office space, Shared office, All-in office with beautiful space, many facilities and modern equippments. 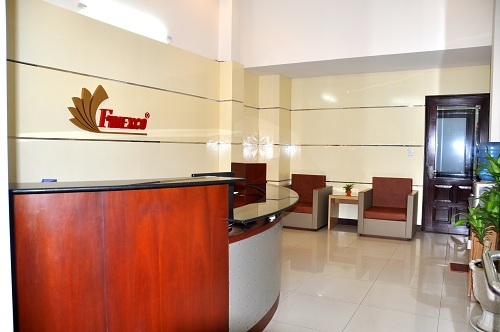 After years of experience in office rental, Fimexco Office with devoted, experienced, and skillful staffs is confident to accompany you in first steps as well as integrating into the economy in Vietnam and the world. Besides meeting room, we also have private rooms and a series of workstation for rental by hour. These are good choices for companies using shared office. What is the benefits of shared office? Who use shared office and all-in office? It includes facilities of an office with low cost. Using this office, you have a business address in the city centre. The PBX switchboard greets your phone calls and the receptionist will answer the calls as well as receives your letters and parcels. You also can use the guest space. Shared office is suitable for people working at home, enterprises with flexible working time, enterprises with no need for a physical office, small and medium-sized companies, and newly established companies. You don’t need to recruit and train a receptionist for your company. Using Fimexco Office service, you will have a professional receptionist. The professionism and the stability are reasons why more and more companies of all sizes have used Fimexco Office’s “shared receptionist”. Shared office is a professional service in trading which is very economical. This kind of service has become popular because of its convenience. Moreover, shared office is very well-equipped to give your customers the best impression at first sign. Starting a business, most of businessmen, small and medium-sized enterprises in Vietnam want a modern office with full facilities in city centres; however, it isn’t easy. They need to spend high cost for big office space, water and electricity, human resources,.. athough these may be not optimally used. All-in office is made to solve this problem. Using all-in office, you can save a great amount of money and time for renting office space, setting up office, paying for receptionist,…. Companies having started business but not been ready to pay office rental. Companies working with few staff. Companies researching marketing before making long-term investments. Companies wanting a convenient business address in city centre. Companies being afraid of building and designing office. Representative office of foreign companies. Companies opening market without paying high cost.